Colorado has more national parks than just about any other state, and leading the fame is stunning Rocky Mountain National Park. This park, located in northern Colorado just outside the popular tourist town of Estes Park, is one of the highest-altitude national parks and home to 60 different peaks. This means incredible hiking, camping, and views. Before you head to the park, prepare yourself for the high altitude. One road, Trail Ridge Road, tops 12,000 feet above sea level, which can floor even locals. Go slowly and pace yourself, stay hydrated and pay attention to your body. Make sure you know the signs of altitude sickness; nothing can ruin a trip quicker than a pounding headache. Before doing anything, we recommend popping by the visitor center to collect important info about road and trail closures, wildlife sightings (for better or for worse) and that day’s ranger-led programs. Then buy your park pass and enjoy the adventure. With more than 300 miles of trails, hiking is the best way to do Rocky Mountain, National Park. You can find hikes for all abilities ages, from short, flat strolls to extreme climbs and everything in between. Not sure which trail to try? Ask the experts at the visitor center. If you're wary about wandering through the wilderness alone try the REI Outdoor School. It offers regular events in Estes Park. This program offers a variety of guided hikes, backpacking classes and other activities. Easy: The 2-mile hike to Dream, Nymph and Emerald lakes. The 0.6-mile Bear Lake loop, an easy interpretative nature trail around a lake. Both of these hikes are really popular and busy during the summer, however. Waterfall hike: Alberta Falls, a 0.6-mile, easy hike up to an impressive waterfall. The trailhead is located at Glacier Gorge Junction. Also beware: This is one of the most popular hiking trails, so get here early before the crowds. Less busy: The medium-level hike to Lake Haiyaha is a bit more challenging, but if you take it slow, it’s manageable for many fitness levels. Make it easier by heading up to Nymph Lake and turning around. But the real treasure is beyond. This four-mile trail has an elevation gain of 865 (so most hikers don’t make it the whole distance) and ends at the quiet, serene alpine lake, which is surrounded by massive boulders and home to the park’s oldest tree. Trail Ridge Road is a Colorado must-see. This road is the highest paved road in any national park in the country and North America’s highest paved through-road, peaking at more than 12,000 feet above sea level. (Popping ears now.) That’s higher than the tree line. Trail Ridge Road gets super busy during the summer and the winding, hairpin roads edged by dramatic drop-offs can be spooky for some visitors. The park also has other high roads with stunning views, if you don’t want to deal with rush-hour traffic on a skinny, dirt road abutting a plunging cliff. Trail Ridge Road is on the National Register of Historic Places. Bighorn sheep, elk, deer, mountain lions, bears, squirrels, even butterflies. A ton of wildlife calls Rocky Mountain National Park home. While you can’t guarantee you’ll see wildlife on your trip, it’s pretty hard not to at least see deer. And in the fall, the elk do a mating party by bugling loudly. It’s a big tourist draw. The park estimates it has between 200 and 600 elk and about 350 bighorn sheep (look up, up, up; they’re sometimes seen on the rocky canyon walls on the way to ​Estes Park). It says there are also 280 different kinds of birds here, making this a bird-watchers’ paradise. Although it may be exciting to see a herd of elk, be smart. Stay away. Stay on roads or in your car. Wild animals can kill or seriously hurt you, your kids or your pets. Stop doing stupid stuff to get a cell phone pic or selfie. Don’t feed the wildlife. Not even rabbits or squirrels. Don’t do it. Know what to do if you see a bear. Bears do live in the park, and it is possible to see one on a hike or while camping. If you see one, stand still and stay calm. Give the bear the opportunity to leave. If it doesn’t go away, it’s time to make yourself as big as possible to try to scare it away. Stand tall, throw small rocks and twigs and make a lot of noise. If the bear charges you, always fight back, the NPS says. Bears in Colorado are most active mid-March through early November. Do pack bear spray. Know what to do if you see a mountain lion. The Front Range of Colorado is prime mountain lion residence. You may even encounter one in the foothills. If you do, don’t run away, or it’s likely to chase you. Instead, back away slowly, facing the lion. Try to look at big as you can. Hold your arms or a stick above your head. If the mountain lion does attack, fight back. Travel in packs. You are safer in a large group than alone. Don’t litter; keep your space clean. Don’t leave food out or throw your granola bar crumbs on the trail. If you’re camping, look for a special food locker (or pack bear-proof containers) or store your food far away from where you’re sleeping. Don’t eat in your tent. Throw trash away in special, bear-proof trash bins. Also, don’t draw attention to your scent with scented toiletries. Cut back on all sweet scents. Talk to park rangers. As the visitor center if there have been any reports of aggressive animals and always report any instances you experience. Don’t let the wildlife warnings scare you, though. Camping in the Rocky Mountain National Park is one of the most memorable and enjoyable experiences in Colorado. There are a handful of campgrounds within the park’s limits, but they fill up quickly, so book your site as far in advance as possible. Here are two camping locations to consider, depending on your individual needs and abilities. This is Rocky Mountain National Park’s only campground open year-round. You can drive right into it or even take a free shuttle to and from Estes Park and Bear Lake. While this is located in the forest and located near some great trails, it does have a solar-heated shower bag stall and ranger-led programming in the warmer months. Definitely pay a visit to the nearby Discovery Center. 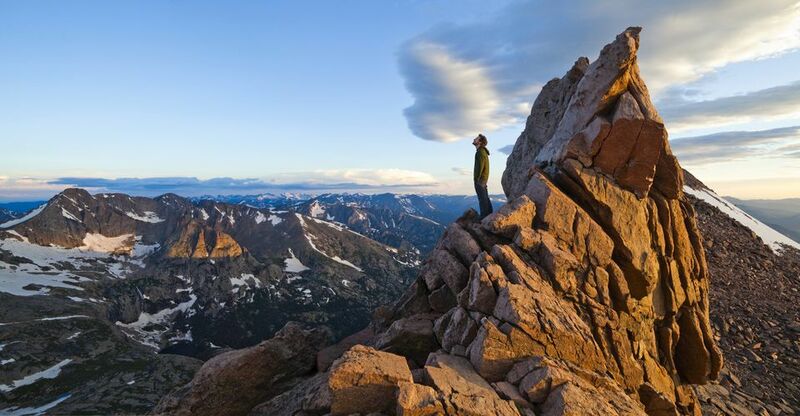 Long’s Peak is one of Colorado’s most beloved fourteeners (mountains that are more than 14,000 feet in elevation), and it’s no easy feat to make it to the top. Even if you can’t (or don’t want to) conquer Longs, it’s a unique adventure to stay the night at the campground, located near the Longs Peak trailhead. Many people who want to hike Longs Peak camp here overnight, so they can leave early in the morning (before the sun rises), so they can make it to the peak before noon when the storms roll in. This campground is high up, at an altitude of 9,500 feet. See the split in the continent where water flows in two different directions, like being on the top of a pointed roof. The Continental Divide is a truly amazing natural marvel to behold. You will cross this divide as you drive along Trail Ridge Road. If you keep cruising on Trail Ridge, it’ll bring you all the way to Grand Lake, another small, charming mountain town comparable to Estes Park (with an old-fashioned downtown and friendly residents), except on the other side of the divide. It’s almost like being on the other side of a looking glass (although residents of both small towns would insist each is unique in its own ways). Regardless, it’s a lovely mountain drive with two worthy destinations on either bookend. Live like a cowboy; stay in a cabin. Camping is one way to overnight in the park, but we also love a rustic overnight in a wooden cabin. While there is no lodging available directly in the Rocky Mountain National Park, there are tons of places to stay right on the outskirts. A favorite is the YMCA of the Rockies in Estes Park, which backs right up to the park. The Y, settled on more than 800 acres of land, feels like being in the middle of nature, but with all of the conveniences of a resort (or maybe a summer camp). Find hiking trails, fishing, a cafeteria, swimming, mini golf, a paint-your-own-pottery studio, a museum, even tetherball, roller skating, and indoor and outdoor basketball. Stay in one of the YMCA of the Rockies’ more than 200 different cabins. A two-bedroom cabin has a fireplace, full kitchen, and porch, and some are pet-friendly. You can find many other cabins on the outskirts of the park, too. Some are more isolated, whereas others are clustered in a group with easy access to towns. Everywhere you turn is another natural marvel. Head to the off-the-beaten-path Forest Canyon Overlook for breathtaking views of the remote corners of the park. Go for a picnic at Hidden Valley, on the east of Trail Ridge Road. Yes, Hidden Valley, like the ranch dressing. These are just two of the many pull-offs, overlooks, lookouts, and observation points with a view. Keep your eyes peeled for signs showing you where to stop. Never stop on the highway, unless you are far off the road and won't disrupt traffic. Even then, it's better etiquette to stop at an official pull-off, because if one car pulls over, others slow down and some will stop to see what you're looking at, too. This adds to the traffic congestion and will make locals cringe. The park offers some great, free ranger-led programs. Night Sky Programs during the summer months. Find stargazing, astronomy, and events like the three-day Rocky Mountain National Park Night Sky Festival and Party With the Stars, with a telescope. A full moon walk, where you can explore the park via moon- and starlight with a guide. Free snowshoeing classes in the winter. A park ranger will take you out and teach you how to snowshoe (beginner through experienced levels). So you want to hike Colorado, but you don't want to die?